This is an old build screen shot, but I'm seeing similar results with 99 star galaxies. How do you folks handle large fleets like this? I mean when you enter into combat, they practically fill the entire combat screen. We all like the turn based combat but does it seem too large? I'm not sure if anyone else feels overwhelmed form managing these number of ships but I do. Also, what would happen if 3 or four fleets like this fought all at once? I'm not sure the combat screen pans out that far. Yeah ships should be more expensive and scale with empire size.Good tactical combat requires less ships to be interesting,imo.Maybe some sort of logistics system too and higher. Ashbery76 wrote: Yeah ships should be more expensive and scale with empire size.Good tactical combat requires less ships to be interesting,imo.Maybe some sort of logistics system too and higher. Upkeep cost should be the way to go. Logistics is too arbitrary in other games and does not realy make sense. Logistics effects the efficiency and health of the army not the deployement size. Money is usually available in large enough amount to serve as a soft brake for large ships, the only question is if the AI can handle this well. I think upkeep costs for ships do need to increase, but this won't stop a determined ship builder on a very large map. The systems in SIS were not designed to handle 99+ star maps, so this problem was inevitable once we removed the restrictions on map size. Auto-resolve and the ability to select groups in combat can help a bit. We might experiment some with squadron grouping mechanisms, especially when we add features for characters and flagships, these might make sense. 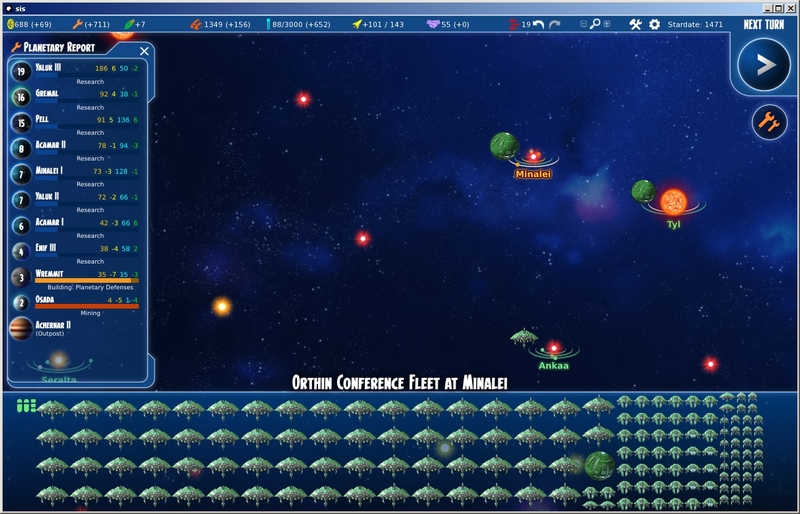 In terms of grouping for movement, we might try adding a shift-drag mechanic that selects and deselects groups of ships to relieve some of the individual clicks needed to separate a very large fleet. 1. New building type to care for the itch of those who wish more building types and make for interesting decisions there. The amount of buildings could directly contribute to the amount of ships that can be built. 2. Trade pool could also serve as the defacto limitation of the fleet. Obviously, only trade ships that are in the pool but are not tied down by food transport could serve in this double-purpose, but once they are assigned to logistical duties, they should not generate any funds anymore. This would make sense as a ship in pool can either transport food, material for the fleet or trade products but not several at once. On the plus-side the pool (which is already integrated in so many levels) would gain another cool use, but on the flop-side: AI currently does not seem to utilize the pool. The fleet size icon on the right hand side would, with the above systems get a real purpose as it would indicate how much capacity the empire has and has left. I'm not a fan of arbitrary or artificial caps on the number of ships. The maintenance costs of ships should be higher, but this already represents logistical support; there's no need to introduce two mechanics for the same thing. And I doubt that micromanaging separate trade and logistics pools would be very much fun. zolobolo wrote: On the plus-side the pool (which is already integrated in so many levels) would gain another cool use, but on the flop-side: AI currently does not seem to utilize the pool. The AI does use the trade pool. Wait it does? But how, if it does not build additional markets? Does it have a dynamic amount of fix pool according to amount of planets owned? Captainspire wrote: I'm not sure if anyone else feels overwhelmed form managing these number of ships but I do. I have been playing all the three default size maps a lot + maps with around 170 stars, but have never come across such a situation. Last edited by zolobolo on Tue Jul 25, 2017 1:32 pm, edited 1 time in total. - Against how many AI do you usually play on these large maps? - Does it declare war on you? - How many ship types does it use? - Can it get past Marauder attacks and expand? - At what difficulty and research speed are you playing and how well does your tech match up to the AI in early, mid and late game? as i'm only testing and don't really play games any more, i tend to test with only one race, but have tested a few times with them all on map. again with your questions, i use cheats to give myself all tech so just see how the game plays out mid to late game, and by then i have either joined the other race or wiped them out and spend the rest of the time expanding and wiping out pirates and landing on other planets to add to mine, this way i can own all of the map and see how it tests towards very late in. With a large map and me taking the diplomatic approach, I find a lot of times I run into races with a fleet that gets obscenely large fleets. Well there you go Your diplomatic needs cannot yet be met appropriately. For in the grim shadow of... stars... there is only war. There is no peace amongst the stars, only an eternity of carnage and slaughter, and the laughter of Dzibix. I like the sound of this. One simple possibility might be to to also look at having admirals only being able to bring so many ships into a single combat, or some penalty if the fleet is larger than their command cap. This would represent the difficulties in commanding too large a fleet and would encourage players to split their fleets up a bit. Artificial caps are the "nuclear option" that I would like to avoid. We're going to have to set some kind of maximum ship cap for battles, because the engine actually breaks at some point around 400 ships in a battle, but short of that I would prefer to balance the game so that the situation just doesn't arise in normal play. If the enemy is not putting enough pressure on you so that you can build enough ships to break the game, then the victory conditions should probably be kicking in.